Condensed milk is a sweet thickened mixture of milk and sugar commonly used in pie, tart and pudding recipes. While condensed milk is often added in its normal form to other ingredients, boiling an unopened can is an option which yields a surprisingly delicious result. The rich, toffee-colored caramel created after the can has been boiled may be utilized for anything from cake frosting to a topping for ice cream sundaes. Boiling condensed milk in a can does not involve advanced cooking skills, but every step should be executed with caution and patience. Fill a large pot 3/4 full with water. Place the pot over high heat until the water boils, then reduce heat to medium high. 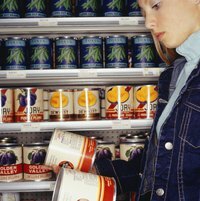 Peel off the labels from the condensed milk can, including any remaining adhesive which may be left on the surface of the can. Place the bare condensed milk can in the pot of boiling water slowly and carefully so as not to splash the water. Add more water to the pot if necessary until the can is completely submerged. Cover the pot. Although glass lids are best for this task as they allow you to monitor water levels without lifting the lid, it is more important that the lip of the lid fit securely over the pot. Monitor the boiling can for three hours, checking every 10 minutes to ensure that the can remains totally submerged in water. Take the pot of boiling water off the heat and turn off all burners. If you want, you may carefully carefully shift the lid of the pot to the side and drain the water into the sink, although allowing the can to cool while the water remains in the pot is fine. Wait as long as necessary for the hot can to completely cool before removing the top. Pour the caramel into an airtight container and refrigerate or use it immediately in a recipe.